The Museum’s Vin Fiz Flyer is not only a unique airplane but it tells a very special story. 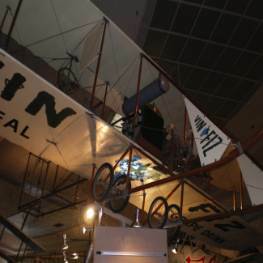 The year 1911 was only eight years after the Wrights’ first powered flights and only three years from their first public flights of a practical airplane. Yet 1911 would mark a milestone, the first flight across the United States. Newspaper baron, William Randolph Hearst, provided the driving force behind this effort by offering a $50,000 prize for the first person to complete a trans-continental flight. This would prove to be an enormous undertaking. In 1911, few roads cross-country roads existed and even fewer airfields. Navigation would have to be by the “Iron Compass” otherwise know as following railroad tracks. In the face of these difficulties, one man with a true spirit of adventure, Calbraith Perry Rodgers (who was rarely seen without a cigar in his mouth) took on the challenge. Rodgers earned his aviator license at the Wright School of Aviation in Dayton, Ohio, in August of 1911, only months before his trans-continental flight. When all was in order, Cal took to the air from Sheepheads Bay, New York on September 17th, 1911. Although the plan called for a large number of stops along the way, in the end there were 75, at least a dozen of which were crashes, and Rodgers was injured several times. Taylor and the team of mechanics rebuilt the Vin Fiz Flyer when necessary, and only a few pieces of the original plane actually made the entire trip. Finally after flying approximately 4,300 miles, Cal landed his plane on the beach at Long Beach, California and dipped his wheels in the Pacific Ocean on December 10th, 1911. The entire trip had taken 84 days, although only about 82 hours were spent aloft! On 25 of those days he was not able to fly because of bad weather, repairs or recuperation from injuries received during less than desirable landings. Cal, with his ever-present cigar, was an aviation pioneer and became a national hero. What remains of the original Vin Fiz Flyer has been retired to the Smithsonian. Our Museum’s reproduction Vin Fiz Flyer is the product of legendary aviation author Peter Bowers. It was built in 1961 to commemorate the 50th anniversary of the first trans-continental flight. The airplane is built to flight worthy standards and has been flown as a towed glider.